I tried this combination today and it was spectacular! I cooked the lentils following the instructions of soaking 1 cup of lentils in 4 cups of water with 1 tsp. of salt for about one hour. Then I simmered the lentils in the same salted water until tender (about 12-15 minutes). Following, I rinsed the Mung beans, put them aside, and brought to boil 3 cups of water with 1/2 tsp of salt. While boiling I poured the beans and allowed the water to come back to boil, covered the sauce pan and cooked it until the water was all absorbed. Did the same with the Quinoa, with a 2 to 1 ratio (2 cups of water to 1 cup of quinoa). 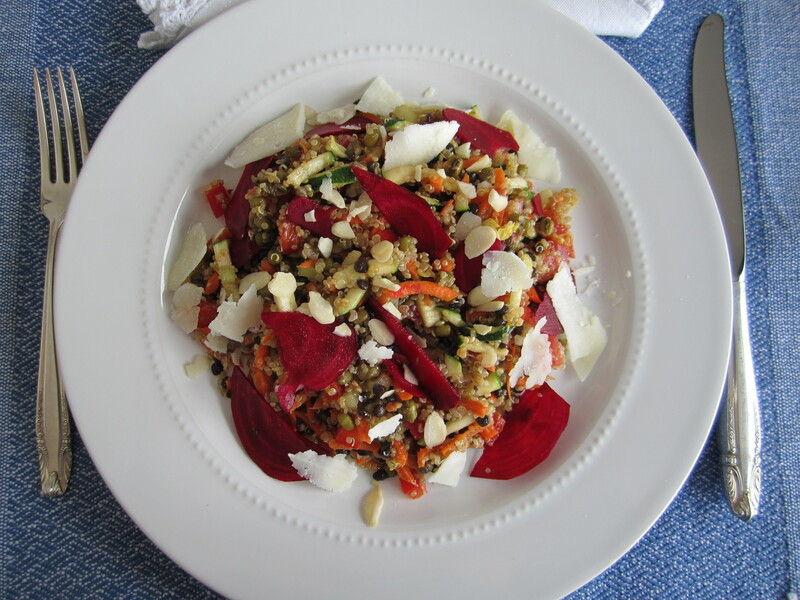 When all grains cooled, I combined some of each grain in a bowl and added fresh vegetables, namely julienned zucchini, chopped red pepper, celery, Roma tomatoes and shredded carrots. I prepared a salad dressing with olive oil, Dijon mustard and apple cider vinegar, a hint of honey and salt and pepper. I mixed it all with the salad dressing and to served I added some millimetre thick beet slices ( to avoid everything else getting red), slivered almonds and shaved Parmesan cheese. It was fabulous! Even my husband that continuously says that he is not a beans and lentils person, enjoyed it very much! Hope you like it as well! Lentils, Lentils, Lentils….. One of my favorite grains, and this time I added some curry to spice it up a little. I cooked 1 cup of lentils with 3 cups of water, added ½ tsp of grape seed oil, a ¼ tsp of salt and ½ tsp of curry powder. Bring it to a boil, lower the heat and let it cook until all water is absorbed, just like you would cook rice. When it was ready I added olive oil and a bit of apple cider vinegar before serving. 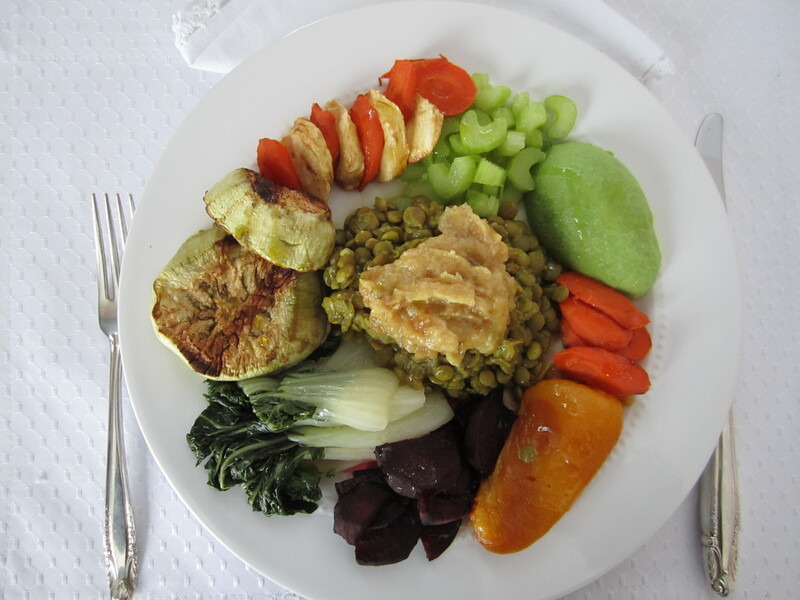 As I am now into the habit of roasting any vegetable that comes to mind, I added to the lentils a generous dollop of roasted garlic and complemented the dish with some roasted carrots, beets, parsnip, yellow pepper and eggplant, as well as some steamed baby bok choy, fresh celery and avocado. Needless to say perhaps, but it was delicious! Ah, don’t forget to add the olive oil and vinegar of your choice, together with salt and pepper to taste. I think you are really going to love this platter. I cut up beets and carrots in slices of just under ½ inch thick, and roasted them in a 425 degrees oven for 25 to 30 minutes, turning them at the halfway mark. I did the same with the eggplant, but the slices were almost 1 inch thick, and I roasted them for 12 minutes on each side. When roasting I do not add any oil or any seasoning to the vegetables. Five minutes before serving I added some goat cheese to the roasted beets and eggplant so that the cheese will warm up and melt a little. 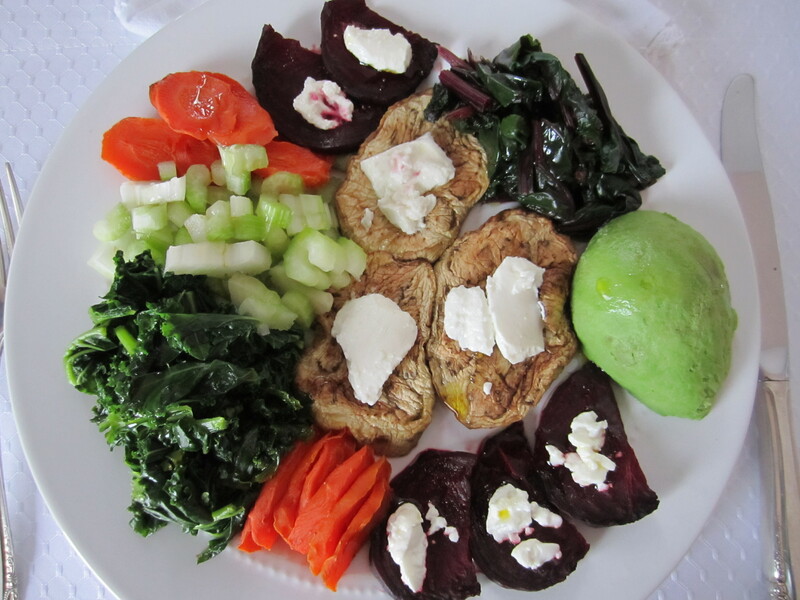 I combined my roasted vegetables with blanched kale and beet greens and added fresh celery and avocado. I find that I need the flavour of fresh vegetables in my combinations! I thought that I was going to miss some type of grain to fill my appetite, but I must say that I was pretty satisfied when I finished it! As always I find that adding olive oil and apple cider or balsamic vinegar give the finishing touch of flavour to my lunches. 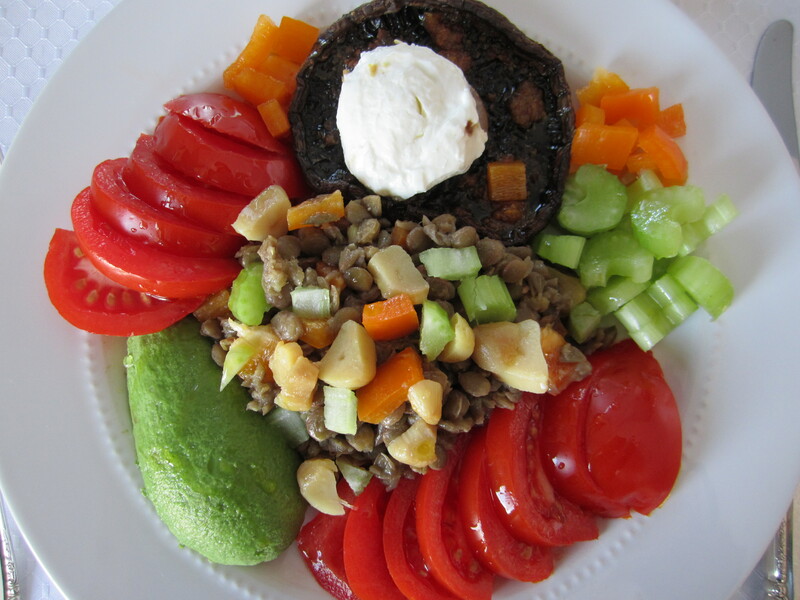 I love lentils and I love mushrooms so I decided to put them together in my luncheon vegetable platter. I cooked the lentils according to the packaging instructions and let them cool to room temperature. I then mixed them with chopped fresh yellow peppers, celery and sliced roasted garlic and added olive oil and apple cider vinegar to taste. I roasted the Portobello mushrooms with chopped garlic, olive oil and pepper and just before serving I topped it with a generous amount of goat cheese. I then put it back in the oven, just long enough for the cheese to warm up. I added to my plate using the extra chopped yellow pepper and celery in addition to the customary tomato and avocado, and flavored with some olive oil and apple cider vinegar to the fresh vegetable portions. It was certainly delicious! Wanted desperately to have bread, so I decided to just go for the veggies without comprising with cheese or some other protein! This is what I came up with: blanched kale, cucumbers, avocado, celery and shredded carrots! Some slices of my favorite multigrain baguette and I was done! The extra virgin olive oil and vinegar, with salt and pepper added to taste, always add to the flavor!